This article focuses on Mennonite Literature in North America written in English since 1960, with particular emphasis on the rapid development of literature and literary criticism since the 1990s. Two other articles in the Global Anabaptist Mennonite Encyclopedia Online (GAMEO) address North American Mennonite literature: the first, by Elizabeth Horsch Bender and Harry Loewen, covers the subject through 1950, with an emphasis on the German language roots of Mennonite literature. The second, by Harry Loewen, covers the period from 1950 to 1985. A number of authors who could be added to his account of this period are inserted in this article. Previous articles considered Mennonite authors as well as the representation of Mennonites in literature. Because of the large increase of literature by Mennonite writers, this article will consider only works by authors with a connection to the Mennonite church, either by birth, family, conviction, or close association. The literary production among Mennonite writers in recent years, and the development of a Mennonite literary criticism, has superseded the more general theme of "Mennonites in literature." Original book jacket for Rudy Wiebe’s Peace Shall Destroy Many (1962). 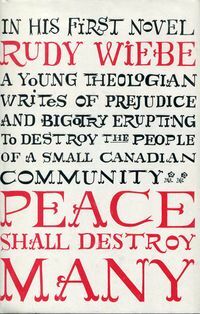 The publication of Rudy Wiebe’s first novel, Peace Shall Destroy Many (1962) has often been cited as the birth of contemporary North American Mennonite literature in English. Wiebe’s novel was reviewed favorably in the national press in Canada but earned him the censure of a group of Mennonite Brethren leaders who encouraged him to step down from his position as editor of the Mennonite Brethren Herald. Wiebe was subsequently invited by American Mennonites to teach at Goshen College in Goshen, Indiana, before returning to Canada and a position at the University of Alberta, initiating a cross-border exchange that has characterized contemporary North American Mennonite literary studies. Rudy Wiebe on his 75th birthday at the at the 2009 Mennonite/s Writing conference at the University of Winnipeg in Manitoba. Photo by Ann Hostetler. Several Mennonite writers notably published literary works in English for the general public on Mennonite subjects before Peace Shall Destroy Many. The Trail of the Conestoga (1924) by Mabel Dunham treats the exodus of Mennonites from Pennsylvania to Ontario after the American Revolution. Gordon Friesen’s The Flamethrowers (1936), a realist novel set in Kansas, tells the story of a young man who rebels against the restrictions of his Mennonite community. Joseph W. Yoder’s Rosanna of the Amish (1940) is based on the story of his mother’s life. Meanwhile, Mennonite fiction began to emerge from Herald Press, a Mennonite publisher. Christmas Carol Kauffman, in Not Regina (1948) and Barbara Smucker, in Henry’s Red Sea (1955) wrote Mennonite stories for young audiences that also educated the broader community. Several American writers also published first novels with major publishing houses during the 1960s: Elaine Sommers Rich’s autobiographical novel for young readers, Hannah Elizabeth, was published by Harper & Row (1964) and Dallas Wiebe’s experimental novel, Skyblue the Badass (1969) was published by Doubleday. Warren Kliewer’s first volume of poetry, Red Rose and Gray Cowl (1960), along with a series of plays, including “The Summoning of Everyman” (1961), “A Bird in the Bush” (1962), and “The Prodigal Son” (1962) appeared in print during this decade, introducing a prolific career in poetry and drama. Patrick Friesen at the 2009 Mennonite/s Writing conference in Manitoba. Photo by Ann Hostetler. Mennonite Literature began to gain momentum on the national scene in Canada during the 1970s. Hildi Froese Tiessen has written about Canadian governmental support of multicultural writers from the 1970s on in Canada, a period during which many Mennonite writers were publishing for the first time. Rudy Wiebe’s third novel, The Blue Mountains of China (1970), focused on a Mennonite story, but he won the Governor General’s Award for The Temptations of Big Bear (1973) about a famous Aboriginal leader. During this decade Patrick Friesen and Andreas Schroeder emerged as pioneering voices in Canadian Mennonite poetry. Schroeder’s The Ozone Minotaur (1969) was followed by several other poetry collections and a novel, The Late Man (1972). Friesen’s debut volume, the lands i am (1976), was followed by bluebottle (1978) and The Shunning (1980), adapted for the stage in 1985. The latter two volumes were published by Turnstone Press in Winnipeg, which played a pivotal role in launching Mennonite writers over the next several decades. In the US during the 1970s, the Mennonite press was still the primary publisher of Mennonite literature. Omar Eby’s first work of fiction, Covenant of Despair (1969), inaugurated a long writing career. First novels by Ken Reed, Mennonite Soldier (1975), and Merle Good, Happy as the Grass was Green (1975), and what might be the first attempt at creating a Mennonite literary criticism in John Ruth’s slender book, Mennonite Identity and Literary Art (1978), were published. Based on Ruth’s Menno Simons lectures at Bethel College in 1976, the full text of this manuscript was first published in Mennonite Life (1977), a magazine that later began to devote an issue to the arts periodically. The 1970s also ushered in two new Mennonite-related periodicals that helped to broaden Mennonite awareness of the literary arts, The Mennonite Mirror (1971-1990) in Canada and Festival Quarterly (1974-1996) in the USA. The burgeoning interest in cultural diversity and the development of feminist literary criticism in the broader literary culture led to wider opportunities for Mennonite artists to engage readers in representations of their ethnic and cultural heritage during the 1980s, notably increasing the participation of women writers. In Canada, first works by fiction writer Sandra Birdsell, Night Travellers (1982) and The Missing Child (1989), poet and critic di brandt, questions i asked my mother (1987), and poet Sarah Klassen, Journey to Yalta (1988), introduced significant women writers who would go on to have distinguished careers. Al Reimer published his Russian Mennonite novel, My Harp is Turned to Mourning (1985), and Armin Wiebe explored the Low German humor of his Russian Mennonite heritage in a poignant and humorous first novel, The Salvation of Yasch Siemens (1984). Lois Braun’s first short story collection, A Stone Watermelon (1986), would be followed by three more in the following decades. Dora Dueck’s first novel, Under the Still Standing Sun (1989), explored the experience of Mennonites in Paraguay. In the USA, Good Books offered an alternative to denominational publishing for writers of Mennonite literature, publishing first novels by Sara Stambaugh, I Hear the Reaper’s Song (1984), and Levi Miller, Ben’s Wayne (1989). Three Mennonite Poets: Jean Janzen, David Waltner-Toews, and Yorifumi Yaguchi (1986) introduced an international trio of writers to American readers. Jean Janzen’s first book of poetry, Words for the Silence (1984), debuted the voice of a significant poet whose work would influence Mennonite hymnody as well as literature. Janet Kauffman, experimental novelist and poet, published the first volume in what would become a trilogy. Her Collaborators (1987) features a Mennonite mother and daughter; this family saga is further explored in The Body in Four Parts (1993) and Rot (2000). In the 1990s, Mennonite literature in the US received national recognition with the publication of Julia Kasdorf’s poetry collection, Sleeping Preacher (1992), winner of the Agnes Lynch Starrett prize of the University of Pittsburgh in 1991, and publication of four of the poems in this collection in The New Yorker. A second collection of poetry by Kasdorf, Eve’s Striptease (1998), emphasized women’s stories and feminist issues. The 1990s was the first decade in which a significant number of US Mennonite writers were published by literary presses. Jeff Gundy’s first volume of poetry, Inquiries (1992), which introduced a prolific new poet and essayist, was soon followed by a second, Flatlands (1995) and a creative nonfiction work, A Community of Memory: My Days with George and Clara (1995), both published by university presses. 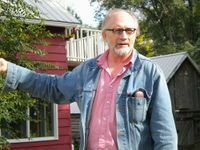 Three volumes of poetry by Keith Ratzlaff appeared during this decade; Man Under the Pear Tree (1997) won the Anhinga poetry prize. Juanita Brunk’s Brief Landing on the Earth’s Surface (1996) won the Brittingham Poetry Prize of the University of Wisconsin Press. Jean Janzen published The Upside Down Tree (1992) in Canada and The Snake in the Parsonage (1995) in the USA with Good Books, the same year in which she was awarded an NEA Fellowship. Canadian poet Di Brandt after a reading at the 2009 Mennonite/s Writing conference in Manitoba. Photo by Hildi Froese Tiessen. In Canada, the 1990s introduced an array of strong new voices in fiction that would go on to win awards and solidify the presence of Mennonite writers among Canada’s leading novelists. David Bergen’s short story collection, Sitting Opposite My Brother (1992), was followed by two novels in this decade: A Year of Lesser (1996) and See the Child (1999). David Elias published two short fiction collections, Crossing the Line (1992) and Places of Grace (1997). Miriam Toews’ The Summer of My Amazing Luck (1996) and A Boy of Good Breeding (1998) introduced the writer who would, in the following decade, become the leading Canadian novelist of her generation. 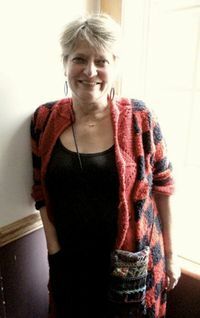 Four works of fiction by Sandra Birdsell, including The Chrome Suite (1992) and The Two-Headed Calf (1997), established her presence as a major writer. Rudy Wiebe won the Governor General’s Award for fiction a second time with A Discovery of Strangers (1994), another of his novels focused on Aboriginal characters and setting. This novel was followed by the collaboration with Métis author Yvonne Johnson, Stolen Life: The Journey of a Cree Woman (1998). David Walter-Toews, already a prolific writer of nonfiction, published a collection of poetry, The Impossible Uprooting (1995), featuring the persona of “Tante Tina” in a series of dialect poems. Di Brandt published two more collections of poetry and three books of nonfiction, including Dancing Naked (1995), a path-breaking work of feminist Mennonite criticism. Sara Klassen published four poetry collections, including Simone Weil: Songs of Hunger and Love (1999). Barbara Nickel published her first book of poetry, The Gladys Elegies (1997) and a novel for young readers, The Secret Wish of Nannerl Mozart (1996). Karl Schroeder published the first of his highly regarded science fiction novels, The Claus Effect (1997), with David Nickel. 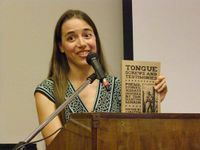 Kirsten Eve Beachy, editor of Tongue Screws and Testimonies: Poems, Stories, and Essays Inspired by the Martyr’s Mirror, promotes the book at a gathering at Eastern Mennonite University. A number of anthologies since 1989 have collected creative work by Mennonite writers and articulated critical frameworks for interpreting it. Liars and Rascals: Mennonite Short Stories, edited by Hildi Froese Tiessen (1989), focuses on Canadian Mennonite short stories. A Cappella: Mennonite Voices in Poetry, edited by Ann Hostetler (2003), brings together poetry by U.S. and Canadian writers. Half in the Sun, edited by Elsie K. Neufeld (2006), focuses on Mennonite Writers from British Columbia and the Pacific Northwest of the USA. Tongue Screws and Testimonies: Poems, Stories, and Essays Inspired by the Martyr’s Mirror, edited by Kirsten Eve Beachy (2010), reveals the influence of this seminal Mennonite martyrology on contemporary writers. Since 1990, six “Mennonite/s Writing” conferences have shaped the critical conversation around Mennonite Literature and Literary Studies and fostered conversation between the writers. The first Mennonite/s Writing conference, focused on Canadian Mennonite/s writing, was held at the University of Waterloo in Ontario. The second conference on American Mennonite Writing was held in 1997 at Goshen College in Goshen, Indiana, and the third, with an international focus, was held at Goshen College in 2002. The fourth conference took place at Bluffton University in 2006, the fifth, with a focus on Mennonite/s Writing in Manitoba, at the University of Winnipeg in 2009, and the sixth at Eastern Mennonite University in 2012. Critical papers, readings, performances, and panels introduced Mennonite writers to each other and have forged a community of discourse that continues into the present. Mennonite literary criticism, which began with the pioneering scholarship of Elizabeth Bender and Harry Loewen, and the complementary narratives of John Ruth and Al Reimer, was fostered here. Kirsten Beachy, Ervin Beck, Jeff Gundy, Ann Hostetler, Julia Spicher Kasdorf, Hildi Froese Tiessen, and Paul Tiessen, among others, have helped to frame the critical conversation in critical papers and selections for conference presentations. Several volumes have appeared as a result of these conferences, including Acts of Concealment: Mennonite/s Writing in Canada, edited by Hildi Froese Tiessen and Peter Hinchcliffe (1992) and Migrant Muses (1998). Selected papers from the conferences have appeared in issues of The Mennonite Quarterly Review, The Conrad Grebel Review, the Journal of Mennonite Studies, and the Journal of the Center for Mennonite Writing. Canadian fiction writer David Bergen reads an excerpt from his novel at the 2009 Mennonite/s Writing conference in Manitoba. Photo by Ann Hostetler. Building on this momentum in a period of literary studies increasingly open to multiculturalism, Mennonite literary studies has sustained its place as a critical discipline throughout the first decade of the 21st century, when Mennonite literature has continued to show increasing quality and variety in both Canada and the USA. Fiction continues to be the strongest genre in Canada, with Miriam Toews winning the Governor General’s Award for A Complicated Kindness (2004), and critical acclaim for her memoir about her father’s suicide, Swing Low (2000), and two subsequent novels, The Flying Troutmans (2008) and Irma Voth (2011), set among Mennonites in Mexico. David Bergen, who published four novels during this decade, won the Scotiabank Giller Prize for The Time in Between (2005). Birdsell’s novel The Russländer (2001), published as Katya in the US, the first serious full-length novel about Mennonite women’s experience in Russia during the revolution, was a finalist for the Giller Prize. It was followed by two other books, including Children of the Day (2005), based on her parents’ Mennonite and Métis marriage. Sarah Klassen published her first short story collection, The Peony Season (2000), as did David Waltner-Toews, One Foot in Heaven (2005). Sarah Klassen brought out a second collection of stories, A Feast of Longing (2007), establishing her commitment to the genre. Darcie Friesen Hossack, Mennonites Don’t Dance (2010), and Carrie Snyder, Hair Hat (2004) and The Juliet Stories (2012), are new writers who carry on the strong Mennonite tradition of short story writing. Dora Dueck’s second novel, This Hidden Thing (2011), about a Mennonite immigrant girl who worked as a maid in a wealthy home, won the McNally Robinson Book of the Year Award for 2011. Rudy Wiebe was made an officer in the Order of Canada in 2000 and his most recent Mennonite Novel, Sweeter than All the World, appeared in 2001. His memoir, Of this Earth: A Boyhood in the Boreal Forest (2006) won the Charles Taylor prize in 2007. Canadian poetry gained new voices in the new century as well: Melanie Cameron and Carla Funk, whose first books, Holding the Dark (1999) and Blessing the Bones into Light (1999) appeared at the end of the 20th century, published additional collections during the first decade of the 21st. Maurice Mierau published Ending with Music (2002) followed by Fear Not (2008). Robert Martens published ever after and other poems (2009) and Al Rempel published a first collection, understories (2010). New collections by seasoned poets also appeared: di brandt’s Now You Care (2003), which takes an ecological focus, was shortlisted for three awards, including the Giller Prize; her essay collection, so this is the world and here i am in it (2007), deepens the ecopoetic conversation and reconsiders her Mennonite roots. Patrick Friesen brought out two new poetry collections, a book of essays, and several CDs. Sarah Klassen produced a new poetry collection, A Curious Beatitude (2006), between her two volumes of short stories. Barbara Nickel published another poetry collection, Domain (2007). Mennonite fiction published in the USA during this time increased, with several books receiving awards: Evie Miller Yoder’s novel Eyes at the Window (2003) was designated a Border’s Original Voices Best New Book and Katherine Arnoldi’s story collection All Things are Labor (2007) received the Juniper Award from the University of Wisconsin Press. The novels during this decade also represented a greater range in style, from the hyperrealism of Stephen Raleigh Byler’s acclaimed novel in stories, Searching for Intruders (2002) to Keith Miller’s fantasy novels, The Book of Flying (2004) and The Book on Fire (2009). Bo Caldwell recounts her Mennonite grandparents’ journey to China in City of Tranquil Light (2010). Sofia Samatar explores fantasy in Olondria, her first novel forthcoming in 2013. Jessica Penner’s novel in stories, Shaken in the Water, was also scheduled for publication in 2013. Several successful works of serial fiction have also appeared in the 2000s, including mysteries by P.L. Gaus and Judy Clemens, and eight science fiction novels by Karl Schroeder. In the US, established writers Jeff Gundy, Jean Janzen, and Keith Ratzlaff published new poetry collections. Julia Spicher Kasdorf received an NEA Fellowship for poetry and published her third collection, Poetry in America (2011). 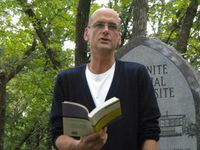 Jeff Gundy’s Deerflies (2003) received the Editions Award and the Nancy Dasher Award, and Spoken Among the Trees (2007) received the Society of Midland Authors Award. In addition, Gundy published a collection of critical essays, Walker in the Fog: On Mennonite Writing (2005). Jean Janzen published a book of essays based on her Menno Simons lectures at Bethel College, Elements of Faithful Writing (2005), in addition to three collections of poems: Tasting the Dust (2000), Piano in the Vineyard (2004), and Paper House (2008). Keith Ratzlaff published Dubious Angels: Poems after Paul Klee (2005) and Then, A Thousand Crows (2009). Poets who published debut collections during this decade include Todd Davis, Ripe (2002), and Rhoda Janzen, Babel’s Stair (2006). Davis brought out two additional collections, including The Least of These (2010). The 2000s have also seen the birth of the Cascadia Poetry series after the press published first two books, by Ann Hostetler, Empty Room with Light (2002), and David Wright, A Liturgy for Stones (2003). Since 2005, the poetry series has published ten volumes of poetry by established and new Mennonites poets: Dallas Wiebe, Cheryl Denise, Shari Wagner, Debra Gingerich, Leonard Neufeldt, Esther Yoder Stenson, Suzanne Miller, and Becca J. R. Lachman, and two additional poetry collections by Helen Alderfer and Chris Longenecker. Drama has been a lesser-known, yet continuous strand in Mennonite literature, from Warren Kliewer’s plays of the 1960s and Merle Good’s plays of the 1970s. Recently, Canadian playwrights Vern Thiessen and Armin Wiebe and US playwright Doug Reed have brought new energy to the genre. Internationally known, Vern Thiessen has won numerous awards for his plays, including the Governor General’s award for playwriting in Canada in 2003; his recent play, Lenin’s Embalmers, also produced on Broadway in New York, was nominated for the Governor General’s Award for Playwriting in 2011. Memoir has been of increasing interest to Mennonite writers. In Canada, as previously mentioned, Rudy Wiebe and Miriam Toews have published literary memoirs. In the USA, the prominence of Old Order Amish and plain-dressing sects of Mennonites, and the tourist industry surrounding them, influence the memoir genre. During the 1990s, Good Books published Shirley Kurtz’s memoir, Growing Up Plain (1994), predicting the increase of “plain” memoirs in the 21st century. Books such as Rolling Down Black Stockings: A Passage out of the Old Order Mennonite Religion (2005) by Esther Royer Ayers, Growing Up Amish by Ira Wagler (2011), and Why I Left the Amish (2011) by Saloma Miller Furlong appeal to the curiosity of readers who want to know what it was like to live a life within the constraints of a religious and cultural lifestyle. Memoirs have been published by Cascadia books, notably Gerald L. Miller’s A Hundred Camels (2009), about his experience as a doctor in Somalia, and Lee Snyder’s At Powerline and Diamond Hill (2009), a memoir of her Mennonite upbringing that framed her approach to the presidency of Bluffton University. A sophisticated approach is taken by Julia Spicher Kasdorf in her collection of autobiographical essays, The Body and The Book: Writing from a Mennonite Life (2001; rpt. 2009) that explores both personal and communal themes, as does Jeff Gundy’s collection of essays, Scattering Point: The World in a Mennonite Eye (2003). In a more theological vein, Dawn Ruth Nelson’s A Mennonite Woman: Exploring Spiritual Life and Identity (2010) parallels her Mennonite grandmother’s life with the author’s quest for spirituality among Catholics in Ireland and Mennonites in Eastern Pennsylvania. On the more commercial side, Rhoda Janzen’s Mennonite in a Little Black Dress (2009) achieved bestseller status, while causing a stir in her home community of Fresno, California, and inspiring more Mennonites to tell their version of their Mennonite story, such as Rhonda Langley, who self-published Mennonite in Blue Jeans (2012). Rhoda Janzen’s second memoir, Does this Church Make Me Look Fat? (2012), probes issues of faith and compares its expression in the Mennonite Brethren of her upbringing and with her current Pentecostal congregation. In Canada, Mary Ann Kirkby self-published her memoir I Am Hutterite (2007), which became a bestseller and was picked up by a publisher (Thomas Nelson 2010). Jean Janzen’s Entering the Wild: Essays on Faith and Writing (2012) explores the Mennonite Brethren faith that has sustained her writing. Priscilla Stuckey takes an alternative approach to memoir in Kissed by a Fox (2012), using an ecological and spiritual framework to explore human and animal relationships and their role in physical and spiritual healing. Blush: Mennonite Girl in a Glittering World, was forthcoming in 2013 from Shirley Hershey Showalter, former President of Goshen College, who has been blogging about memoirs since 2009. Several publications started in the 21st century have followed the pioneering lead of MennoNot (1990-2003) to foster and serve as an outlet for Mennonite literature: Rhubarb Magazine, published by the Mennonite Literary Society of Canada, and the online Journal of the Center for Mennonite Writing at www.mennonitewriting.org. Although the publishing world in 2013 is changing rapidly, with the digitization of print media, and Mennonites are becoming assimilated into Canadian and US mainstream culture, the literature shows no sign of abating, but rather has developed in quantity, quality, and sophistication. Mennonite writers may not write to re-inscribe Mennonite identity, but rather, write against identity, says Hildi Froese Tiessen in “Homelands, Identity Politics and the Trace: What Remains for the Mennonite Reader?” (MQR 2013), invoking Canadian critic Robert Kroetsch (2013). It is the Mennonite reader, she claims, who will recognize the “trace” of Mennonite faith, community, and cultural values in the work of today’s Mennonite writers, several generations removed from the stories of their ancestors. A survey of Mennonite literary production in North America over the past 50 years or so shows that Mennonite writers have entered the literary mainstream. Nonetheless, their work continues to probe Mennonite historical narratives, faith stories, and communities, often through a critical lens. From its beginnings in the early novels of Rudy Wiebe, contemporary Mennonite literature has also explored the cultural transition that accompanies migration and acculturation. Poetry, in particular, has given voice to those marginalized and silenced within the community, and has tested theological concepts. Characters in recent fiction, such as the novels of David Bergen, may have lost their Mennonite moorings, but not the Anabaptist predisposition to critiquing the world or taking obligations to others seriously. Miriam Toews’ characters often find themselves clothed in the habit of community, but when it comes to addressing spiritual malaise or individual suffering, the community is found lacking. 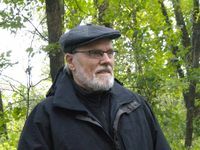 Mennonite literature also registers a shift from rural roots and connection with the land to an urban or cosmopolitan setting with its plethora of possibilities and intensification of consumerism and environmental degradation. The relationship of humans to nature has also emerged in the literature, as is evident in the recent poetry of Di Brandt, Todd Davis, Jeff Gundy, and Julia Spicher Kasdorf. The voices of lyric poems are never far from a compassionate witness to life’s tensions and contradictions. Recent works such as Carrie Snyder’s The Juliet Stories also explore Mennonite service abroad. Earlier works of experimental fiction by Dallas Wiebe and Janet Kauffman are joined by recent works of speculative and fantasy fiction such as the novels of Keith Miller and Sofia Samatar, suggesting possible new directions for Mennonite writers. Beck, Ervin. "Mennonite/s Writing in Canada, updated 2011." Center for Mennonite Writing. Web. 30 December 2012. http://www.mennonitewriting.org/. Gundy, Jeff. Walker in the Fog: On Mennonite Writing. Telford, PA: Cascadia, 2004. Hostetler, Ann. "Afterword: Contemporary Mennonite Poetry in America." In A Cappella: Mennonite Voices in Poetry. Iowa City: Univ. of Iowa Press, 2003: 177-189. Hostetler, Ann. “Bringing Experience to Consciousness: Reflections on Mennonite Literature, 2004.” Journal of Mennonite Studies 23 (2005): 137-150. Hostetler, Ann. “The Unofficial Voice: The Poetics of Cultural Identity and Contemporary U. S. Mennonite Poetry.” Mennonite Quarterly Review 72, no. 4 (October 1998): 511- 528. Reimer, Al. Mennonite Literary Voices: Past and Present. North Newton, KS: Bethel College, 1993. Reimer, Douglas. Surplus at the Border: Mennonite Writing in Canada. Winnipeg: Turnstone Press, 2002. Ruth, John. Mennonite Identity and Literary Art. Scottdale, PA: Herald Press, 1978. Tiessen, Hildi Froese. “Homelands, Identity Politics, and the Trace: What Remains for the Mennonite Reader?” Mennonite Quarterly Review 87, no. 1 (January 2013): 11-22. Tiessen, Hildi Froese. “Mennonite/s Writing: State of the Art?” Conrad Grebel Review 26, no. 1 (Winter 2008): 41-49. This article is based on the original English essay that was written for the Mennonitisches Lexikon (MennLex) and has been made available to GAMEO with permission. The German version of this article will be available at at the MennLex site. Hostetler, Ann. "Literature, North American Mennonite (1960s-2010s)." Global Anabaptist Mennonite Encyclopedia Online. February 2013. Web. 21 Apr 2019. http://gameo.org/index.php?title=Literature,_North_American_Mennonite_(1960s-2010s)&oldid=143641. Hostetler, Ann. (February 2013). Literature, North American Mennonite (1960s-2010s). Global Anabaptist Mennonite Encyclopedia Online. Retrieved 21 April 2019, from http://gameo.org/index.php?title=Literature,_North_American_Mennonite_(1960s-2010s)&oldid=143641. This page was last modified on 15 January 2017, at 23:07.